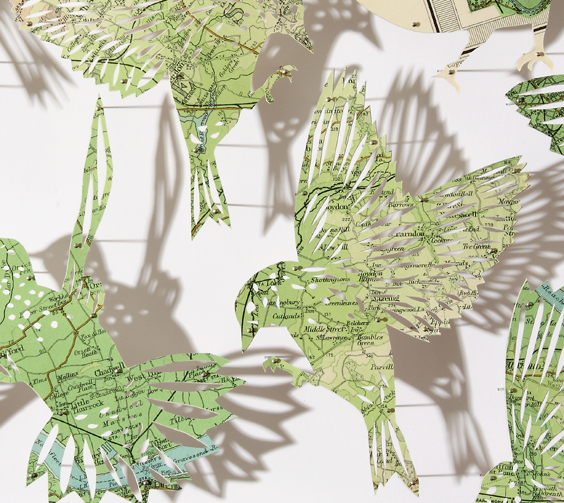 Claire Brewster: Questions, Questions, Questions - Why maps? This is another question I get asked regularly, which deserves some thought. 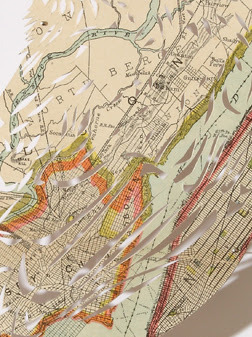 So why maps - they are something I have always collected and been fascinated by. They offer the opportunity to dream and to travel the world from the comfort of your own front room. Maps just seem to lend themselves to making art work. The patterns that are created by the contour lines, the road markings, symbols and colours are so fascinating and when they are abstracted out of the map and turned into a bird become so feather like. I spend a lot of time looking at the maps and working out which bit is best and will work best with the bird. I also love the the quality of the printing and the paper that you find with old maps, modern printing whilst obviously quick just doesn't have the same quality and life. I am also very passionate about the reusing of materials, and re-appropriating things that have lost their original purpose and in the process giving them a new one. Paper maps are becoming redundant because we mostly use satnav's or google maps now, they are much more immediate and very up-to-date though often not so accurate. The thing with paper maps is they make you see the bigger picture, where as satalite navigation is much more focused on the route you are taking, which can lead to all sorts of problems as we blindly follow them, without noticing that they are not perhaps taking us on the best route or leading us somewhere we shouldn't be going. Maps for me are integral to the process of making work. I also love the hunt, the adventure of not knowing what I am going to find. I cannot control the sources, I can only use what I can find which is all part of the creative process for me. I hope you are enjoying this series of questions and am always happy to answer any questions on my work or the process. Lovely, lovely. Where do you find all your maps? Thrift stores? Antique stores? I have a hard time finding maps here... atlases however, are everywhere! Hi Faith, thanks for your kind comment, I usually get most of my maps from ebay or etsy and sometimes junk shops. someone mentioned your name over at Geninne's blog and that's how I showed up. and i would have thought the use of maps was self-evident. Hi, thanks so much for your kind comments. You would be surprised how many people ask about the maps and why I use them.